Did you know that Dewy headed up the commission that investigated Trotsky in Mexico? 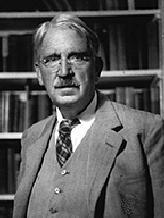 John Dewey, like Socrates, was a philosopher first and educational theorist second, and like Socrates, his progressive educational theory has been simplified to the level of caricature. It is often assumed that he favoured an extreme version of discovery learning. This was not in fact the case. As a philosopher he was what is called a ‘pragmatist’, a school of philosophy that emerged from Pierce and James in the 19th century. As befits an American with strong democratic beliefs he saw education as leading towards authentic participation in a democratic nation. His reflections on the nature of knowledge, experience and communication, combined with his views of democracy and community, led to an educational theory that started with a broad based vision of what education should be, an identification of educational methods and a practical view of its implementation. He practised what he preached through his own ‘Laboratory School’. He is best known for his problem-solving approach to learning. In line with his view that science and experimentation lay at the heart of learning for both a person and society, he encouraged innovation and abhorred dogmatic principles and practices. For Dewey, exposure to certain types of learning experiences are more important than others. Schools should create learning opportunities by engaging in occupational activities, as practised by the rest of society. He was keen on ‘occupational’ learning and practical skills that produced independent, self-directing, autonomous adults. That schools had become divorced from society was one of his basic claims. In his model school, the students planted wheat and cotton, processed and transported it for sale to market. Dewey spoke out against communism as well as the right-wing threat in US politics, including what he saw as reactionary Catholicism. A recent reappraisal sees him as a typical American liberal believing in a secular approach and reform in education, moving it beyond the limitations of traditional ‘schooling’. He was refreshingly honest about their limitations and saw schools as only one means of learning, ‘and compared with other agencies, a relatively superficial means’. In fact, he was keen to break down the boundaries of school, seeing them as a community within a community or an ‘embryonic society’. Schools are necessary but must not get obsessed with streaming, testing and not be overly academic in the curriculum. They must reflect the real world, not sit above and apart from society. However, Dewey was not a full-on progressive and had little time for Rousseau’s free approach to the acquisition of knowledge and skills. Structure and teaching were important. Perhaps his most important contribution to education is his constant attempts to break down the traditional dualities in education between theory and practice, academic and vocational, public and private, individual and group. This mode of thinking, he thought, led education astray. The educational establishment, in his view, seemed determined to keep themselves, and their institutions, apart from the real world by holding on to abstract and often ill-defined definitions about the purpose of education. Dewey is a child of the Enlightenment, a progressive thinker, not a traditionalist. More importantly for our purposes, experiential learning through Kolb and others had its origins in Dewey. His views on schools and how they relate to a modern, democratic society are also of lasting interest. Those involved in the modern debate about a more active role for schools in their community can benefit from a re-reading of Dewey as he raises important issues about the relevance of education, the destructive institutional practices and the lack of practical, pragmatic, vocational and life-skills teaching. Dewey, J. (1916) Democracy and Education. An introduction to the philosophy of education (1966 edn. ), New York: Free Press. Dewey, J. (1938) Experience and Education, New York: Collier Books. (Collier edition first published 1963). Dewey, J. (1929) Experience and Nature, New York: Dover. (Dover edition first published in 1958). Campbell, J. (1995) Understanding John Dewey. Nature and co-operative intelligence, Chicago: Open Court. Ryan, A. (1995) John Dewey and the High Tide of American Liberalism, New York: W. W. Norton. I'm enjoying your series and good to reflect on each . Interested to know what criteria you used to select the fifty ? Thanks Paul. Not a scientific choice. mainly the people I've read and been influenced by. However, I've added a few after reader suggestions. I am also enjoying your recollection. While doing some research on how Dewey has influenced Kolb's experiential-based learning theory, I found this great resource that you may find useful as well. It contains thousands of classics(including many of Dewey's books) fully accessible online. There are also a number of Dewey's works available at archive.org.